For many of us, the Internet is an irreplaceable part of our daily lives. We use it to consume the latest news, shop for essentials, post valuable photos, stream our favorite programs, connect with our friends and family and access important city services. We use it to read, view, buy, connect and satisfy the fundamental needs of our lives — online. Some of us also use it to grow our businesses, to provide information and services to our customers. Others go online to find jobs, gigs, and learn the skills to earn them. All of us finding quality of life and prosperity on the other end of an internet connection. For the most part, we get to use the internet how we want — in a way that meets our needs, our interests and our way of life. What you may not know is that we’ve been using the internet under certain rules known as net neutrality. These rules are longstanding principles of the internet and were given force in 2015 to keep the internet neutral and open. Meaning that you can access all lawful online content equally. Also, under these rules, your internet service provider can’t favor or block one site or application over another. They can’t slow down access to a site, determine how fast content travels or charge you more for the luxury of accessing information and services online. More pointedly they can’t give preference to one site owner because one paid more than the other. What you also may not know is that the Federal Communications Commission is now looking to repeal net neutrality, exposing the internet to discrimination. This comes at a time when the largest internet service providers are also content companies, giving them every reason to favor their own services over their competitors if the rules aren’t there to stop them. Now these companies are also selling ‘smart city’ products, offering to put themselves in between you and the basic functions your city provides: public safety, transportation, sanitation, you name it. When the City of New York integrates connectivity into our operations, we need to know every resident can access those services without capitulation to their internet service provider. The tech community at large agrees. And, so do we. Today, the City of New York is taking action, alongside the tech community, in an effort to save an open internet. Mayor Bill de Blasio and 49 other mayors submitted a letter to the FCC to uphold the net neutrality principles. We’re also providing information on NYC.gov to help visitors learn more about net neutrality, how it affects New York City, and about an open comment period during which New Yorkers’ voice may be heard by the FCC. Why? Connectivity is not only the foundation for how we participate in today’s world, it’s also the future of our cities. It’s how cities can provide better services and be equitable to our city’s residents and visitors. For the busy parent who doesn’t have time to wait in line to register for city benefits, the internet is a means for her to do this from home after she’s put her children to bed. It’s her way of communicating with her family that might be an ocean away. And, it’s her gateway to a better job opportunity or the business she’s been dreaming to start. It’s how New York City can enable smarter city functions that create a better experience for those who live, work and play here. We were recently ranked 4th for smart city readiness. As we continue to explore emerging technologies and tools that will be a part of the future of our residents, we need an equitable playing field and fair competition. The threat is that the companies that want to control who gets to access what internet content and at what speed and price also want to own the products and technologies. Cities are potentially at risk of limited access to technological advancements if internet providers prioritize their own products and stifle competition. Net neutrality repeal could hinder technology startups that depend on it to gain fair and competitive access to customers. We depend on a thriving startup community to drive advancements and continued economic growth. In the interest of inspecting the arguments of those who would see net neutrality extinguished I did what we all do… Googled it. I came across this fantastic evaluation of each of the main arguments against an open internet. There is also a topic on the fringe of the net neutrality contest but very relevant — “zero rating”. Zero rating is the practice of some service providers giving something for “free” to customers. What could be bad about “free”? No such thing. More pointedly to this discussion is the evidence of the intentional, even strategic use of discrimination for profit. To understand this better all you have to do is turn on the TV and wait for the first commercial break. You will undoubtedly see an ad for a major carrier offering its customers free access to a premium content network without using their data plan. No coincidence that the service provider recently acquired the content network. This is happening in plain sight, serving as evidence that they will strategically exploit the power to choose who gets what, and as a consequence — who wins and loses. The good news is that we have freedom of speech, and each and every one of us can submit a comment to the FCC to maintain net neutrality. Which I encourage you to do — today! What if you couldn’t do that? 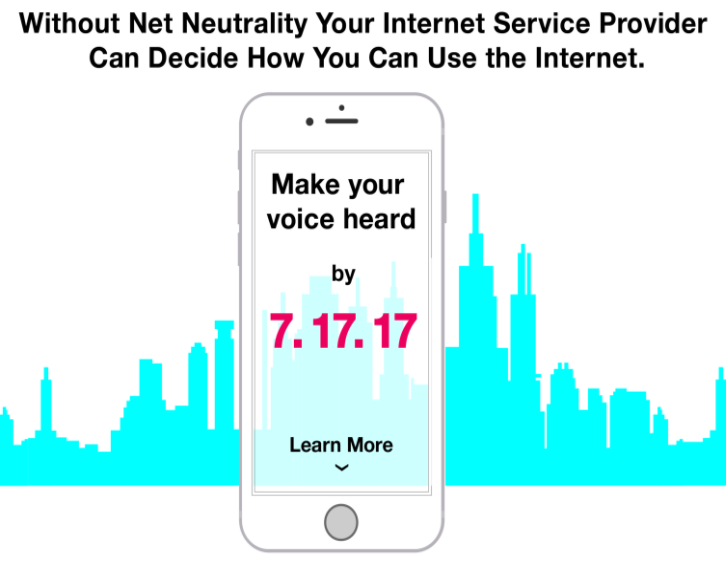 In a world without net neutrality, you might not have access to this content to learn about policy issues that could affect your life. 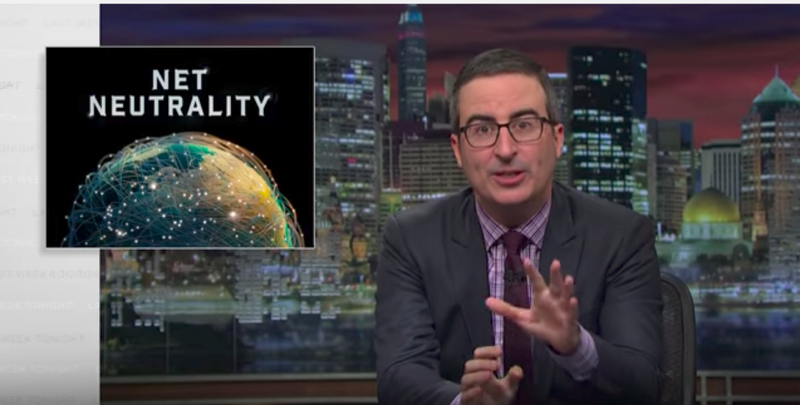 Some of you might remember when John Oliver flooded the FCC website in an effort to save net neutrality. Together, maybe we can make that happen again today.